The Puritans destroyed most organs in country churches, so after the Restoration of the Monarchy, instruments were brought in to lead the singing. Galleries were built at the west end of churches for the singers and players, who, besides leading the musical parts of the Sunday services, played for dancing at harvest-time and Christmas, led the Club Walk at Whitsun, and when invasion threatened led the militia on parade. The musical mainstays of church services were the metrical psalms, either the Old Version from 1562, or the New Version from 1696. The beginnings of the Old Version, by Thomas Sternhold, John Hopkins and others, pleased Henry VIII, and the project continued to publication under Edward VI. Late in life Sternhold acquired land near Hursley in Hampshire, commemorated by an iron plaque in the church. 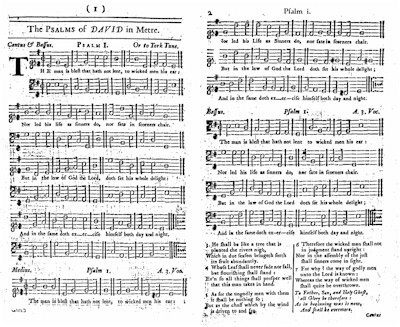 The New Version is represented in today's hymn books by only two survivors, Psalm 34 Through all the changing scenes of life and Psalm 42 As pants the hart for cooling streams. The Old Version is represented by the Old 100th (Psalm 100 in the Old Version) All people that on earth do dwell. Rather more of Southampton-born Isaac Watts's psalms and hymns are in common use, and the 250th anniversary of his death on 25 Nov 1748 was commemorated in Southampton with a week of celebrations of his life and work. Each church used its own favourite tunes for many psalms. Much of the music is quite unknown today partly as a result of its deliberate suppression by the Oxford Movement during the middle of the 19th century, among whose leaders was John Keble at Hursley. The village music is different from the church and band music we are used to, being much closer in style to traditional or folk music. Few bands could afford printed music, and they usually copied it out by hand, often making their own arrangements and compositions. Even where old favourites survive in today’s church, the old style of performance and the instrumental introductions, interludes and codas of the village settings bring a surprising freshness. Many manuscripts were burnt by reforming Victorian parsons, but some families preserved their old books. These are now found in county record offices, museums, and The Royal School of Church Music, together with tune books printed "for the use of country choirs", and from these we take our repertoire. From Nether Wallop in western Hampshire there is a MS book of dances and a few anthems and psalms, and an Alto and a Bass book. From Bramley in NE Hampshire there are two MS books of anthems and psalms. From Winchester comes a similar MS book, beautifully written. There are similar sources for carols, anthems, hymns and psalms and related secular music all over the country. Among the secular pieces we sing are traditional folk songs, glees, rounds and catches. Thomas Hardy wrote most affectionately of the bands and choirs, although in his day they were already in decline. His grandfather, father and uncle were all musicians in the band at Stinsford and Puddletown, so he was steeped in their tradition in spite of feeling an outsider. George Eliot, and Charlotte Yonge of Otterbourne also wrote about the bands from personal experience, indeed Charlotte Yonge's father helped to build Ampfield and Otterbourne churches, financed by Sir William Heathcote of Hursley, patron of Keble.